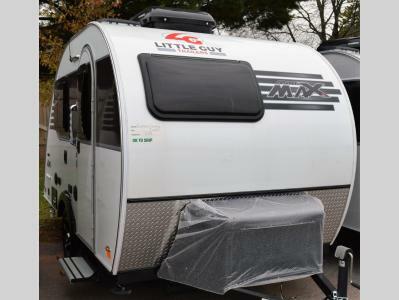 For your next camping trip, you will want this Little Guy Mini MAX teardrop trailer. 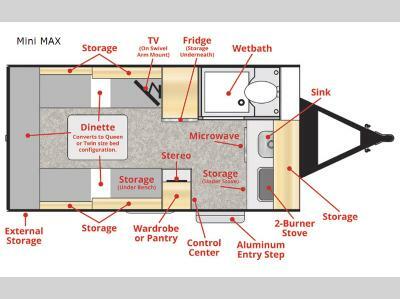 There is sleeping space for two in this model, and you will enjoy plenty of conveniences, such as a wet bath with a three-function sprayer and a marine-style toilet. Enjoy your meals at the U-shaped dinette that can convert into one queen-size bed or two twin-size beds. Your perishables will stay cool in the 5 cu. 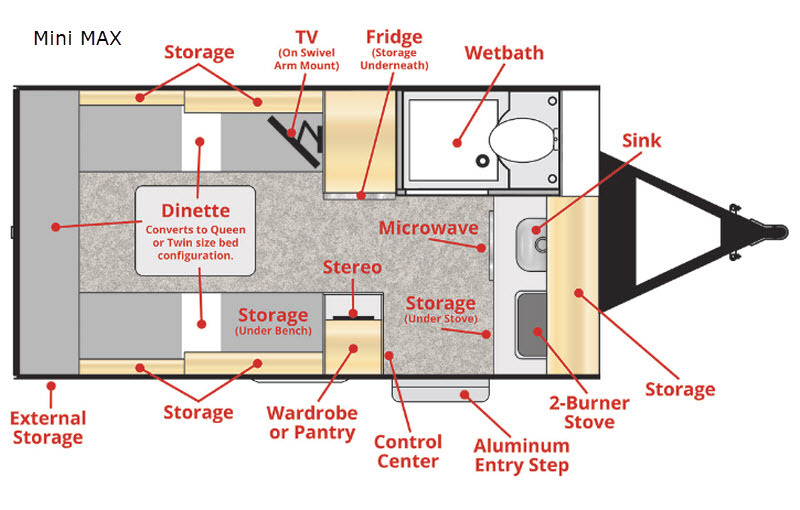 ft. refrigerator which has a Euro-style, tall profile and is astonishingly large for this class of RV. The five insulated dual pane windows have a darker tint for privacy and temperature control, and when you are laying in bed at night, you can enjoy a view of the stars from the vertical stargazer window which opens nearly 90 degrees and offers plenty of natural light during the day. Are you ready for a quiet retreat in the woods or at a nearby campground? You will want a Liberty Outdoors Little Guy teardrop trailer! These models have a large pass-through storage area, aluminum-framed sidewalls and roof, plus a one-piece seamless fiberglass roof. Inside, you can choose between light Maple or dark Walnut hardwood cabinets, and the 13,500 BTU roof-mount Dometic air conditioner will keep you cool in the summer. The Rough Rider Package is ideal if you plan to use the Little Guy on rough terrain. You will also find that there are plenty of upgrades to choose from, such as Zamp solar power, a Furrion wireless observation system, and a Jack-It bike carrier.